Dimensions in OH&S became a certified B-Corporation (B-Corp) in 2013, a process that took about 6 months. 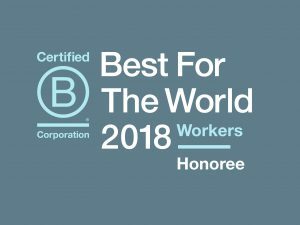 I’d like to take an opportunity to explain what a B-Corp is, what the concept may mean for occupational and human resource development professionals, and why our company decided to go through the certification process. Characteristics of workplace interactions that enhance or detract from employee perceptions of well-being and health behaviors.